Fourteen months ago, Aurora resident Prentiss Bailey was going about happily living his life as usual. He was employed at a printing company where he’d worked for 10 years—a job that paid $17 an hour and that with the consistent overtime and $4,000 and $5,000 annual Christmas bonuses he got, enabled him to take care of his family and enjoy what he considered a middle income life. Today, he and his 10-year–old daughter live in a homeless shelter. So does 33-year-old Robert Estes, also of Aurora. They’re among the nearly 193,000 people who’ve been added to the ranks of the poor in Illinois since the Great Recession began and among the nearly 440,000 that have been added since 1999, bringing the state total to 1.73 million, according to the latest 2010 Census data. The numbers reflect many newly poor people like Bailey, who previously held good paying full-time jobs that were cut; and folks like Estes, who was low-income, but had heretofore been able to make ends met. Both are now left unable to support themselves and their families without help from social service agencies and non-profits—among many people in that same boat. The latest Census numbers also paint a picture of poverty that continues to spread beyond urban areas to suburban communities in Chicago and across the country that are ill equipped to handle the growing population of poor. That was before he was laid off 13 months ago. Bailey, who for the first time in his life is receiving public aid, has lived at the shelter for about five months. Initially, he and his daughter slept on mattresses in a gymnasium-like room with others. Now the two share a small room in the transitional housing section of the shelter furnished with bunk beds. “It was hard at first, but I’m glad I took that step,” he said, noting he’s receiving guidance on getting back on his feet from a case worker at Hesed House. He plans to enroll in truck driver training program to improve his prospects of landing work. 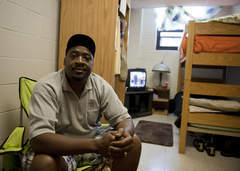 Estes, who’s been at the shelter for about six weeks, says after losing his $12.50-an-hour job at a local grocery store where he’d worked for two years, he hasn’t yet been able to find another one. The economy is “pretty horrible,” he said. “You have people here of all ages that are struggling. Some people tell me how they used to make $20 bucks an hour, $25 bucks an hour. Now they’re here. Nobody wants to hire them. The shelter sits next door to the Aurora Area Interfaith Food Pantry, where on a recent Monday morning the parking lot was packed as people arrived seeking food. “When I first started here in ’08, if we had 80 families, 90 families come in one distribution day, that was a big day,” said Marilyn Weisner, executive director of the pantry. “Now we have routinely 260, 280 families come,” said Marilyn Weisner, executive director of the pantry. Census data suggests that is occurring. The bureau recently noted the poverty rate among young adults ages 25 to 34 living with their parents nationally was 8.4 percent, but that rate would be 45.3 percent if the poverty level was determined by their own income. “We often hear, ‘I lost my job or my husband lost his job, my daughter lost her job and now she’s moved in with me and now I need some extra help,’” Weisner said. Social service providers say they have seen dramatic increases in requests for help from the growing number of poor in Chicago’s suburbs. New census data shows the rate of poverty in Chicago rose 2.9 percent from 1999 to 2010. In Chicago’s suburbs, it rose a bigger 3.7 percent. The poverty rate, stood at 21.2 percent in Chicago 2006, the year before the recession began, but climbed to 22.5 percent last year. By comparison, in the suburbs, the rate rose from 7.3 percent to 9.3 percent. Boland noted Catholic Charities has seen requests for food in some Chicago suburbs rise anywhere from 110 to 150 percent, compared to about 25 percent in Chicago. A Brookings Institute poverty study released last year by University of Chicago researchers looking at 30 Chicago suburbs found most of those suburbs experienced more than 50 percent increases in the number of poor from 2000 to 2008. The study also found that few suburban communities have the social services infrastructure in place to address the challenges of poverty. The rise in poverty in Illinois and nationally can’t simply be attributed to the recent recession, said Amy Terpstra, associate director of the Social Impact Research Center at Heartland Alliance said. She noted poverty rates have risen significantly since 1999 as median household incomes have dropped and added the poverty numbers include people who work full-time, year-round, but are still poor. The drop in income is affecting the poor, and middle-income families. An analysis of Census data done by the center shows that in Cook County, the median household income last year was $51,466, down $8,625 from 1999 and down $3,351 from 2006. In DuPage County, the median was $72,471, down $16,362 from 1999 and down $7,203 from 2006. In Lake County, it was $74,705, down $12,932 from 1999 and down $6,583 from 2006.